Gay & Fisher. The Commission for Relief in Belgium. 1929. Chapter Eleven. The provinces of Belgium and Northern France were not the only regions where great armies marched and fought, where field and town were devastated, where homes were invaded by hunger and disease. Eastern Galicia, Congress Poland, Serbia, Montenegro, Albania, and Rumania were invaded, fought over, and held, for varying periods, under the military rule of the invader. All did not suffer equally, nor were any---with possibly one exception---in a situation comparable to Belgium and Northern France. The occupied territories of Eastern Europe were, as far as food was concerned, normally self-supporting or nearly so; and hence, though the closing of their frontiers increased destitution and suffering, it did not mean famine for a large industrial population. This is not to say that there was no need for relief, for the need was very great, but this need was primarily for aid to individuals, the victims of destitution or disease, not for the organized revictualment of the occupied area. Extensive and invaluable individual relief, especially medical relief, was delivered in certain of these territories by the American Red Cross and several private organizations of American or European origin, but the only attempt to organize general revictualment---in Congress Poland---failed because the belligerents could not agree on the conditions under which this relief should be given. One reason for the refusal of the belligerents to make the necessary concessions has already been suggested; that is, that there was less need of general revictualment even in partially industrialized Congress Poland than in Belgium. But more than this, when these negotiations were undertaken, the siege warfare had begun and neither the Allies nor the Central Powers were willing to concede anything which might limit the effectiveness of the blockade or hamper measures of defense against it. By mid-summer 1915, when the International Commission's negotiations broke down, the military situation in Poland was rapidly changing, and the need of relief increasing. At the beginning of May the Central Powers had launched their great drive against the Russians with the battle of Gorlice-Tarnow. Overwhelmed by a great concentration of artillery, the Russian lines broke before the Mackensen phalanx, and an even greater disaster was averted only by a general retreat of the Tsar's armies from the Baltic to the Carpathians. The Germans occupied Warsaw on the 1st August, and by the middle of October virtually all of Congress Poland was in the hands of the Teutonic armies. The inevitable destructiveness of military operations of this magnitude was greatly increased by the deliberate policy of devastation carried out by the forces of the Grand Duke Nicholas in their retreat. The destruction of the crops, the confiscation of animals, and the forced migration of part of the population of the eastern districts rendered the agricultural sections unable to support themselves, much less to provide food for the industrial centers of Warsaw, Lodz, and the Dabrowa mining region. In Congress Poland voluntary committees supported refuges for orphan children and, as far as their resources would permit, operated free soup kitchens for the destitute. Their funds came from private donations, from city administrations, from the Russian Government and Russian societies, and from Polish, Jewish, and other societies abroad. These funds were sufficient for the program, but the program was not enough. Faced with a condition which local resources were entirely inadequate to meet, the Polish Citizens' Relief Committee of Warsaw, with the approval of the German General Staff, appealed to the C.R.B. to make an investigation with a view to undertaking the relief of this territory. Despite the magnitude of the Commission's responsibilities in Belgium and Northern France, and fully aware of the political complications inherent in the Polish problem, Hoover authorized Kellogg to make the requested investigation as a preliminary to negotiations with the belligerents. Kellogg made his investigation in November and delivered his report early in December. In the meantime Hoover had discussed with German authorities the support they were prepared to give, and on the 22d December he placed the matter before Sir Edward Grey and asked for the approval and co-operation of the Allied Governments in the project. "Please wire Hoover New York, destitution in Poland approach of winter desperate. Requested by Warsaw Committee and Kessler(311) make personal inspection devastated territory, view possibility organizing provisioning under auspices Commission Relief Belgium. Am making no undertaking. Expect leave October 31 return November 10. Affairs Belgium satisfactory. Poland(312) in charge. German authorities grant permission old clothes into Northern France. Please wire wife Kellogg." In view of already existing transportation and staff difficulties we believe should not depart from former decision to restrict activities to present sphere. Cable immediately your views regarding reply to Kellogg. See no objection Kellogg investigating Poland, and we should lend every help possible to the situation. Could probably get an institution here to take on the administration. However, all would depend upon feasibility arranging approval Allied Governments, covering source of supplies and the securing of transport and finance. The districts of Poland occupied by the German Army, which are the only part of Poland that this report concerns, are inhabited by about 7 1/2 million people and include an area of 75,000 square kilometers. Three-fifths of the population is rural, depending on agriculture for its living; of the two-fifths in towns, nearly 80 per cent are factory workers and their families. For fifteen months without interruption this country and its people have had to suffer from the enormous hostile activities of two great armies with all the inevitable devastating effects of military operations on a grand scale. During the great retreat of the Russian Army there was put into effect a military measure that, however well justified and effective it may have been from the military point of view, resulted in an enormous disaster to Poland, and terrible hardships for its population. This was the carefully planned and radically carried out laying waste of a broad zone of the country by burning its villages, destroying its crops and herds, and breaking up its means of transportation and communication. Four thousand villages were burned and two million people were made houseless. As the houses of the country villages and towns in Poland are almost all built of wood with heavily thatched roofs, they were totally destroyed by the fires, only a heap of ashes and a slender brick chimney with open fireplace in its broader base indicating what was once a villager's cottage. Today, as one travels through the devastated regions, one's eyes are arrested and saddened by the sight of irregular rows along deserted country roads, of these black and bare chimneys standing up stark and staring from the flat Polish plain. These are all that reveal the sites of the one-time comfortable villages of the land. The Russians attempted to take with them in their retreat the inhabitants of these villages, undoubtedly intending to take care of them in Russia. But the pressure of the German Army was too severe and the Russians had to hurry on eastward without their burden of frightened people. These were pushed right and left into the fields or forests adjoining the roads in order to free these roads for the army and its transport. By the time the German Army had arrived, many of the unfortunate people had gone into the roads again and had begun their slow procession homeward. Again they were pushed aside, this time hiding more deeply in the forests from fear of the strange invaders. With the final passing by of the German Army, the people came out again from their hiding places and began making their slow way westward. These sad processions were mainly composed of old men, women, and children and they were almost all on foot. The people carried with them those few of their belongings that they had clutched up when forced to leave their villages. Some of these fugitives traveled on foot as much as one hundred kilometers east and finally the same one hundred kilometers west. Returning, as such simple, bewildered people naturally would under such circumstances, to their homes, they found there only ashes and bare chimneys. Some of them, notably the weaker and older, being unable to do anything on the sites of their former homes, betook themselves into the nearest city. Scores of thousands, for example, crowded into Warsaw and became at once a load on the already suffering population there. Others clinging more tenaciously to "home," began to make rude shelters for themselves by the side of bare chimneys. These shelters are in many cases merely a sort of dugout, with low mud walls and a roof above ground composed of poles, soil, and thatch. Into the single room of this shelter the family crowds to sleep and to protect themselves on days of rain. Their cooking is done outside in the fireplace at the bottom of the standing chimney. I saw on the occasion of my visit to one of these burned villages in the first half of November barefooted women and children trying to boil their potatoes---all their meal---at the outdoor fireplace in the rain and sleet. In normal times the agricultural produce of the part of Poland occupied by the German Army was not sufficient to meet the needs of the population, the country being, as already noted, nearly two-fifths industrial. The deficient food was mostly supplied from Russia. The war operations lasted through the harvest period of 1915. Not more than one-third of the land lay outside the scope of these operations. As a result the harvest was very meager. Great quantities of standing grain were burned or otherwise destroyed, cattle and pigs were seized or killed, many farm implements were annihilated. In some districts no sowings had been made. Add to this the constant and heavy requisitions made by both armies on all undestroyed grain and animals, and it is very easy to see how it is that the Polish people now find themselves in terrible extremities for food. To understand thoroughly the whole plight of the country, however, one must take into consideration also the position of the large factories and industries, as a large portion of the inhabitants are factory workmen with their families. In the present German-occupied districts of Poland the number of factory workers is about 750,000, making with their families a total strictly industrial population of 2,000,000. The influence of the war has been, in many ways, more terrible on this part of the people than on the agricultural part. Nearly all the factories and large industries have for various reasons stopped work from the beginning of the war. First among these reasons has been the impossibility of obtaining a supply of raw materials for the factories, as almost all of these materials have to be imported. This is the reason of the stopping of the spinning mills, which represent the chief industry of the country. The second reason is the cutting off of the Russian market, which has always been the chief buyer of Polish exports. This reason especially accounts for the stoppage of the iron mills, which represent the second industry in the country. Third, most of the factories making use of local raw materials have had to stop work because of the interruption of railway traffic and constant requisition by the military authorities. Finally it should be noted that a great many factories were actually destroyed during the fighting and sieges by bombardment or fire. From as reliable statistics as can yet be collected, it is apparent that only about 20 per cent of the population occupied in industry and agriculture have worked normally during the long war period. Add to this the serious derangement to the occupations of other classes of the population. Not a single branch of the economic activities of the Polish population but was immediately affected. All trade with Russia was paralyzed at once, and commercial interests of all kinds suffered severely. A large number of representatives of the liberal arts found no sale for their offerings; governmental officers were out of employment, or at least received no salary. In an especially hard position were all those dependent on the Russian Government, as old-age pensioners, families of soldiers, etc., etc. The number of soldier families in Warsaw alone is 35,000, and in the whole of the occupied districts the number reaches 300,000, which means a total of 1,200,000 persons affected. In the same situation are the families of the old-age pensioners, the pensioners themselves being nearly all invalids. The outcome of all these immediate results of Poland's unfortunate position as the seat of more than a year of war on the grand scale is that the country is stripped of its means of subsistence and the great mass of its people are now either wholly or in part dependent on charity or rapidly approaching this condition. In Warsaw alone, for example, at least one-third of the population is now being aided by local charities. Famine diseases, such as hemeralopia, xerosis conjunctival, ulcus corneae ex inanitione, are becoming prevalent. A special disease of this type, known as hydrops-anasarca ex inanitione, consisting of a swelling of the whole body, degeneration of muscles, weakness of sight and hearing, and general deterioration, has appeared. In the town of Sosnowize alone 110 cases of the disease were noted in six weeks, half of the number being children. Efforts were being made by the Poles to relieve some of the hunger and suffering. A large Bürger-Komitee was organized in Warsaw very soon after the beginning of the war. This committee is composed of twenty-four leading men of the city with Prince Lubomirski as chairman. Each member is chairman of a special section, or subcommittee, made up of other men not included in the main Bürger-Komitee. Each section has its own special subject of attention, as finance, food, children, women, finding work, the homeless, etc. Contributions of money have been secured from various private sources and some money gifts have been received from America and elsewhere. In addition the Bürger-Komitee has obtained a small credit from a Warsaw bank. On the basis of these gifts and credit, the committee had organized and is carrying on a considerable amount of charitable work. It is maintaining eighty-one soup kitchens and tea houses in which soup or tea and bread are given daily to a large number of people either wholly gratis or against the payment of a few kopeks, this payment being regulated by the ability of the recipient of the charity to pay. Over 100,000 people are receiving food from their soup kitchens and tea houses every day, one-third of whom pay from 5 to 10 kopeks a day. The ration in these soup kitchens is one liter of soup and 200 grams of rye bread daily. In addition the Bürger-Komitee is helping to maintain a considerable number of refuges for houseless old men and women and for children who have been made orphans or half orphans by the war. Twenty-five thousand children are now being cared for. Most of these unfortunates are fugitives from the destroyed country villages. The committee also maintains sixty-four special shops scattered over the city where limited amounts of certain food necessaries are sold at reduced prices. Special Jewish soup kitchens have also been established, mostly on a basis of charity extended by Jewish organizations. One private institution alone, "Esra," maintains twenty-five soup kitchens in which 35,000 people receive soup and bread at the price of four kopeks. But even if the Bürger-Komitee and the other charitable Polish organizations had considerable financial resources, they would be unable to make these resources go far, first because of the high prices of what foodstuffs are available and second because of the actual total exhaustion of certain foodstuffs. There are practically no fat meats or other fats at present available. Also dried vegetables, such as rice, peas, and beans, are practically exhausted. Sugar is almost wanting, and, because of the destruction of cattle, milk is available in only very small quantity. There is great need of condensed milk. Children and the infirm aged are suffering terribly from lack of milk, both for direct consumption as drink and as means of preparing special child's and invalid's foods. There is a certain limited quantity of flour and a larger supply of potatoes. What foods are available can of course be easily distributed in Warsaw, Lodz, and other cities, but in the country means of distribution are wanting and if it were not for the fact that the potatoes are still scattered in the fields and local regions in which they have been grown, starvation of the people would assume horrible proportions. Thousands of families, including old and infirm men and women, and children of tender age, are maintaining life at present on practically no other food than potatoes. Potatoes alone, in whatever quantity available, without fats and proteins, cannot long support life, especially in a cold country and among people subject to exposure. The weak, of course, go first: the children, the aged, and the sick. Then the strong become weak and the new-weak succumb. Besides the lack of food, the lack of footwear and bed-covering is becoming very serious. I saw barefooted children in November, even in the charitable refuges in Warsaw where the greatest efforts are being exerted to care for these little unfortunates; the committee in charge simply could not provide the necessary shoes and stockings. The Poles need charity: that is, actual gifts of food, clothing, and money. Materials are more valuable to them than money because of the actual inability to buy any longer certain necessaries in Poland, and because of the enormous prices of the few available commodities. But more than the charity of actual gifts are needed the permission and the means of importing food and clothing from the outside world. The Poles ask the world for this rather than for money. They can manage to establish foreign credit to a certain extent, if only they can be given opportunity to buy commodities abroad with this credit and to bring them into Poland. They ask, in a word, for exactly the kind of assistance that the Commission for Relief in Belgium is now giving Belgium and the North of France. That is the reason they address specifically to the Commission what is really a petition to the world. I stated that the attitude of the Allied Governments would undoubtedly be based on a number of considerations. First of all would be that the native foodstuffs of Poland at present existent in the country, and a quantity equivalent to any which had been absorbed by the German Army, would need to be made available for the Polish population. Major von Kessler stated that practically no food of any consequence had been taken out of German Poland and there was no difficulty over the restriction of the native food to the population. I stated that the second and most difficult problem would be one of finance, and it was obvious that charity was no longer available for these large food schemes; that some form of substantial regular income must be set up for the Commission, and I asked Major von Kessler if it would be feasible to formulate some kind of obligation on the primary governments and municipalities in Poland, to be taken up by the Reichsbank and interpreted to us in the form of foreign exchange to the amount of 20,000,000 francs per month. He stated that he would take the matter up and represent strongly the necessity of some such arrangement as this. I then represented to him that the present attitude of the Allied Governments toward foodstuffs going into these occupied populations was such that I believed if we wished for success it would be necessary for me to be able to put the matter up as a sort of cooperation of the Germans and the Allies through us and that the Germans would have to be prepared to find in Germany a certain amount of foodstuffs, and I understood they had an excess of potatoes, sugar, and salt, and could furnish some cereals. In these circumstances the question could be confined to oversea imports, fats, condensed milk, and high protein producing foodstuffs. He stated that the situation was so acute that something of this kind might be accomplished and that, in any event, we should find the Germans prepared for the fullest co-operation of which they were capable in their present physical condition. He stated that Germany was short 15 to 20 per cent of her usual food supplies, but that this reduction was no disaster to the population and of no military value to the Allies, but no further reduction could be allowed to the population by way of sacrifice of food supplies to the kindred of the Allies, and he advanced the usual German view that if the Allies wished to impose a blockade on their own kindred the responsibility for the consequences must be with the Allies. I then said that, of course, the Commission for Relief would require facilities for organization and it seemed to me our results of general work with German officers in Northern France had been so admirable that we should want to follow that type of organization. Major von Kessler stated there would be no difficulty whatever on this point. I stated that shipping would be a prime difficulty even if all the other stumbling blocks were overcome and that we should certainly have to depend on the Germans for shipping across the Baltic and probably for oversea shipping, if the Allies would consent to our use of German ships. Major von Kessler stated that shipping across the Baltic could be arranged provided the Allies would agree not to submarine the ships carrying relief. As to oversea shipping, that question could only be settled by us with the Allied Governments. (314) I informed Major von Kessler that in all these questions which embraced the rights and wrongs of the civil population it was necessary to have wide ventilation of the question in all neutral countries in order that public opinion might be formulated which might impress the governments on both sides and tend to bring them to a solution, and I thought it would be desirable that such public opinion were created. I represented to him what had been the results for Belgium on both sides and he agreed with me that it was not only admirable but necessary. The saving action undertaken on such a large scale by the American social corporations in Belgium expressed itself in the organizing by the Commission for Relief in Belgium of food supply for many millions of inhabitants of Belgium and partly of France. From the very beginning of the war Poland found itself in a peculiarly difficult situation. During fifteen months without interruption this country has had to suffer from the enormous hostile activities of the two armies, which devastated it far more than Belgium, where the war operations lasted only a couple of months. We state hereby in a general outline the extent of the disaster which has fallen on the Polish land, the actual state of penury of the inhabitants, and take the liberty to suggest some of the means which could be undertaken to improve at least partly the critical situation. Knowing the noble feelings which ruled the American nation in their so generous help in Belgium, we dare hope, Sirs, that you will not refuse to support our petition. The districts of the Kingdom of Poland occupied by the German Army, are inhabited by about one-third of the total population of Poland and reach an area of 73,120 square kilometers. The population amounts to 7,596,000, of which the rural districts have 4,690,000 inhabitants and the town districts 2,906,000; Warsaw, 1,000,000; Lodz, 644,000. As we see, from the above, three-fifths of the population is rural and therefore agriculture is their chief way of earning their daily bread. The population of the towns, on account of the comparatively weakly developed commerce in this country and owing to a certain concentration of factories in towns, consists chiefly of factory workers---about 80 per cent. In normal times the agricultural produce of the part of Poland occupied by the German Army was scarcely sufficient to cover the demand, the country being to a certain amount industrial. The deficient food was supplied from Russia. The war operations had an ill influence on the harvests of 1914 and 1915. Only a small part of the land---about one-third---was not affected by the crisis. A large percentage of the estates and farms have been either totally or partially ruined; great quantities of grain were burned during the fires, these being the result of the battles and fights which were going on. A perhaps greater catastrophe was the destruction of large quantities of standing corn, in the northern and eastern districts of the country, during the last retreat of the Russian Army, as this retreat took place in the months of July and August with the result that no harvest was possible. We must also draw attention to the fact that owing to the military operations large quantities of farm stock were requisitioned or destroyed, also a great number of agricultural estates, with the result of decrease of production. For these reasons no sowing took place in certain districts of the country, either this year or last. Owing to the lack of accurate figures and statistics, we cannot give a precise calculation of the actual decrease of the agricultural production. From the above we come to the conclusion that this year's production has been greatly reduced. To understand thoroughly the plight of the country we must take into consideration the position of the large factories and industries, as a large portion of the inhabitants of this country are factory workmen. In the occupied districts of Poland the number of factory workers is about 750,000, which amounts to about two million with the families. Their prosperity depends only on the possibility of these factories being active. The influence of war on this part of social life has been even more terrible than on agriculture. 1. Impossibility to supply the raw materials to the factories, as they were imported from abroad in normal times. This consideration stopped all work in the spinning mills, which occupy the first place in this country. 2. Owing to the cutting off of the Russian market, which was always the chief buyer of Polish export, a lot of factories had to be stopped, especially the iron works, which occupied the second place in the production of this country. 3. Of the other factories, which employed the local raw materials, and which found buyers in the country itself, only a small number were capable of continuing their work, and this owing to the stoppage of the railways, their occupation by the military authorities also total destruction of a large number of factories which were situated on the actual fighting line. Handcraft and trade suffered to less extent than industry, yet for the same above-mentioned reasons and especially owing to the lack of raw materials, only a small number of workshops were active during the war. From statistics, which we were able to gather, we may come to the conclusion that only about 20 per cent of the population occupied in trade, industry, or agriculture worked normally during the war period. Revising the position of the other classes of the population, we can specify that the economic shock of the war was so great that not a single branch of social life was spared, and everybody suffered to a larger or smaller extent. As soon as the means of communication with the West were stopped, all the transit commerce with Russia was paralyzed. A large number of representatives of the liberal arts, also of civil servants, could not earn anything owing to the changed conditions. In an especially disastrous position, after the retreat of the Russian Army, were those who were dependent on the Russian Government, and were left behind. In this class we must especially draw attention to the families of the soldiers, also of the old-age pensioners. The numbers of soldiers' families in Warsaw alone is 35,000 and in the totality of the districts occupied by the German Army attains 300,000---which means a total of 1,200,000 affected. The result of this situation of the country has naturally had a disastrous effect on the condition of its inhabitants. The number of persons dependent in Lodz alone on public philanthropy is 70,000, and in the whole country, several hundred thousand. According to the opinion of the competent German authorities, the quantities of flour, meat, and sugar still found in the country may suffice for the first needs. An adequate supply of potatoes and salt has been promised, as well as assurance given not to requisition any of the above articles. But, as it is clearly seen from the above, the quantities of products existing now in the country cannot satisfy the needs of the population, and this compels us to request most earnestly the Commission for Relief in Belgium to allow the free import through its channels to Poland of food products, especially of rice, peas, beans, etc., and also of bacon and fats. Remitting this most earnest petition to the Commission we dare assert, Sirs, that thanks and blessings of millions of human beings will accompany your noble efforts to bring them assistance. Further Resolved that a copy of this Resolution be sent to the President, the Secretary, and the Director of the Commission for the Relief of Belgium. In sending this may I add a personal word to the effect that present conditions in Poland are most harassing and that unless immediate relief is sent, tens of thousands of people will die of starvation and cold. It is the firm conviction of all those who know the situation that only a Commission like yours can do effective work, as the supplies which you could send would be immune from requisition by the German Government; and that American agents will be absolutely impartial in the distribution of relief. I am closing with the hope that your Commission will see the way clear to start their beneficent activities at once. Knowing your keen desire to mitigate in every possible way the human suffering arising out of the war, I feel justified in bringing before you a suggestion on behalf of the civil population in Poland. I attach hereto a petition which this Commission has received from the large representative relief committee in Warsaw, and also the report made as the result of personal investigation at our instance by Dr. Vernon Kellogg, until lately Director in Belgium of our work there. No added words of mine can darken the picture of misery and despair which these statements depict, representing as they do what would have been the state of Belgium but for the relief afforded under international auspices, with your earnest support. I have had some informal conversation with German authorities, who assured me that there are cereals and potatoes available in Poland and elsewhere, from which, by mobilization and organized distribution, some sort of minimum ration can be provided. The other items of dietary do not exist in Poland and they are critically necessary to preserve health to the strong, life to the weak, and to forefend from the whole population already incipient famine diseases. The shortage of these particular commodities in Germany leaves no hope of help to Poland from that quarter. I am assured by these German authorities, that protection will be afforded to local and imported supplies for the exclusive use of the civil population, also that every facility will be afforded to this Commission in its task of organization and distribution under proper guarantees. It appears to us that the deficient fats, beans, etc., together with condensed milk for children, can only be obtained by imports from overseas, for which there would seem to be a route practicable from the Western Hemisphere to Sweden, with transshipment thence via Danzig or Libau. We could not undertake such a task without the approval and co-operation of the Allied Governments. In the provision of food supply for these people we should need, not only to rely on charity, but to assemble all the economic resources of Poland and its institutions, in much the same manner as has been done in Belgium, and we should need the permission of His Majesty's Government to facilitate exchange and banking operations. The painful gravity of the situation in Poland cannot be gainsaid, nor need I apologize for the interest this organization has taken in the Polish people, in addition to our other very grave responsibilities. We have no desire to add to our burdens, but if the fourteen months of service in Belgium have commended us to the various belligerent governments, it is our duty to use the confidence thus acquired on behalf of the Polish people; and I wish to add that if the Allied Governments are prepared to assent to such relief measures, and if any other institution can be summoned to undertake their execution, this Commission would be glad to give any advice arising out of its experience or, alternatively, we should be glad to incorporate such other body in any organization we might set up. A month elapsed before Hoover received a reply from the Foreign Office. In the meantime the Poles and their friends in America endeavored to bring the pressure of public opinion to bear on the British to relax the blockade to the extent of allowing the Commission to import relief supplies. Without definitely refusing to consider the relief project, the British Government did not encourage it, maintaining that the Central Powers by confiscation and export of native Polish supplies were wholly responsible for the present condition of Poland. In the public controversy which continued for the rest of the year the question of Polish relief became more and more a weapon with which the belligerents attacked each other on the battlefield of propaganda. The Germans declared that the inhuman and illegal blockade of the Allies was responsible for the sufferings of the Poles, and the Allies replied that the inhuman and illegal policies of the Germans, their exploitation of the resources of conquered territories, made relief futile. In his official reply to Hoover, Sir Edward Grey did not close the door on further negotiations, but he demanded a guarantee from the German and Austro-Hungarian Governments(316) not to export native Polish products or use them for the occupying armies before the Allies would make any arrangement with the Commission for relief. POLISH ORGANIZATIONS IN THE UNITED STATES TO H. H. ASQUITH, BRITISH PRIME MINISTER, requesting sanction of British Government for Polish relief through the C.R.B. I have read with interest the telegram representing the views of the Polish organisations in the United States. His Majesty's Government are earnestly considering the question of Polish relief in consultation with the French Government, but they are faced with accumulating evidence that not only is the present shortage of the necessaries of life in Poland due to the systematic confiscation and export of native stocks by the occupying armies, but also, notwithstanding the deplorable condition of the country today, this process of spoliation still continues. The past history of this process was summarised in a report by a leading member of the Polish Independence Party published in our own press last November, and evidence of the continuance of these confiscations appears daily in the Austrian press. Four thousand five hundred wagon loads of potatoes were to be sent from Lublin to Vienna last October, and a decree of December 23rd regulates the importation from Poland into Austria of cattle, sheep, pigs, poultry, eggs, meat, tallow, milk, and many other articles. On November 12th the Vienna press announced the arrival of large shipments of geese from Poland. It is impossible to resist the conclusion that the stoppage of such exports and the replacement by Germany and Austria of the stocks seized in the past would remove the danger of starvation and that little if any importation from overseas is necessary. The first step to be taken in the interests of Poland is the establishment of an organisation on the spot to control all remaining stocks and to obtain from the German and Austrian Governments the guarantee of a daily ration to the population equivalent to the foodstuffs seized in the past. In view of what has happened in Belgium where the Germans have used every effort to remove all resources of the country not covered by specific guarantees, it is certain that any permission to import from overseas before these steps have been taken would only stimulate the requisitions of the enemy by giving him the assurance of supplies to replace what he takes. Please accept my assurance of the deep sympathy of His Majesty's Government. GREY TO HOOVER, stating guarantees demanded from Germans prior to discussion of importation into Poland by C.R.B. I have carefully considered your letter of December 22nd, regarding the proposed scheme for the relief of Poland. 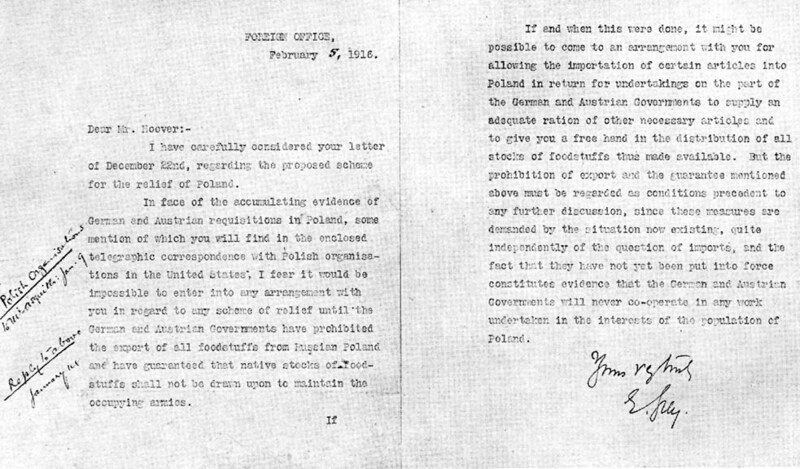 In face of the accumulating evidence of German and Austrian requisitions in Poland, some mention of which you will find in the enclosed telegraphic correspondence with Polish organisations in the United States, I fear it would be impossible to enter into any arrangement with you in regard to any scheme of relief until the German and Austrian Governments have prohibited the export of all foodstuffs from Russian Poland and have guaranteed that native stocks of foodstuffs shall not be drawn upon to maintain the occupying armies. If and when this is done, it might be possible to come to an arrangement with you to allow the importation of certain articles into Poland in return for undertakings on the part of the German and Austrian Governments to supply an adequate ration of other necessary articles and to give you a free hand in the distribution of all stocks of foodstuffs thus made available. But the prohibition of export and the guarantee mentioned above must be regarded as conditions precedent to any further discussion, since these measures are demanded by the situation now existing, quite independently of the question of imports, and the fact that they have not yet been put into force constitutes evidence that the German and Austrian Governments will never co-operate in any work undertaken in the interests of the population of Poland. Hoover immediately took advantage of the slight encouragement contained in Sir Edward Grey's letter. He asked Ambassador Gerard to get, if possible, the required undertakings from the Berlin authorities, while he continued to press the British Government for favorable consideration of the plan, utilizing recent reports of Polish conditions made by Caspar Whitney of the C.R.B. and F. C. Walcott of the Rockefeller Commission. (318) Finally Hoover drafted a memorandum containing specific proposals for Polish relief. This he submitted to the British Foreign Office, the Russian Ambassador at London, and the German Government through Ambassador Gerard. The Hoover plan contemplated the provisioning of Poland only to the 1st October 1916, for Russian Poland, unlike Belgium, is predominantly agricultural and it was therefore assumed that after the harvest there would be sufficient local supplies to furnish an adequate ration for both rural and urban population. As you are aware, we have been since early last December trying to see if something could not be done with the Allied Governments to open a hole in the blockade for Polish relief. In this matter we have been unceasing in our importunities here and have been backed up by the various Polish associations throughout the world. These associations in the United States have been called into general convention and other means taken to ventilate the whole question. 1. A letter addressed by me to Sir Edward Grey on December 22nd. 2. A telegram sent by the United Polish Committees in the United States to Mr. Asquith. 4. Sir Edward's reply to me on February 5th. This last document is the one of importance and, although it does not at first sight appear to go very far, and is written in the usual phraseology of combatants, I can assure you that there are really possibilities in it, for it contains some considerable, although qualified, promise. It is impossible to guarantee anything in these times of unprecedented heat, but I feel convinced that the more humane section of the English Government wishes to see something done for Poland. On the other hand, these men have their own difficulties with their own associates and their own people. The two preliminary points set out by Sir Edward Grey, the prohibition of exports from either Austrian or German Poland(320) and undertaking that the native stocks should not be drawn upon, do not seem to me to be an insuperable thing to accomplish, and I have the feeling that if the Central Governments would do this and if they would go further and allow the export from Germany of certain amounts of cereals, potatoes, sugar, and salt, we could open a gate of importation from abroad via Stockholm and Danzig for at least a similar value of foodstuff. In any event, it will probably occur to you that a counter offer of this kind from the Central Governments would put them right in public opinion. I understand that, in view of the pressure of publicity which has been given to the Polish question and the fact that their blockade carries with it some responsibility in the matter, the British Foreign Office has, this morning, sent the entire correspondence to the press. Knowing perfectly well your keenness on behalf of the Polish people and the efforts you have made at different times to ameliorate the situation, I have the feeling that perhaps you will be willing to again make a further attempt in the matter, for there is really, in this dispatch, some foundation for a negotiation. The matter has now got beyond everything we can do as simple, unofficial persons, and I feel that if you are able to develop something with the German Government, Mr. Page at this end would be able to advance it another step on this side. In any event, the matter is now in your hands and I await your advice and judgment as to what can be done. In the event that the Commission for Relief in Belgium shall be able to assist in the ravitaillement of Poland, the following principles are agreed to by the German Government. 1. The Americans have the right of control in exact agreement with the convention arranged for the North of France and/or Belgium. 2. The German Authorities pledge themselves that all the food supplies introduced by the Americans shall be applied exclusively to the use of the civil population and distributed according to the methods now obtaining in North of France and/or Belgium. The distribution is to be made through the Polish Local Committees under the supervision of the American Representatives or Delegates and the German Relief Officer for the civil population. 3. The German Authorities guarantee that all food supplies originating in Poland shall be used exclusively for the civil population and the constabulary. Excepted from the above are surplus potatoes left after the needs of the civil population and constabulary have been completely covered. The constabulary is required to pay cash marks or equivalent for whatever foodstuffs they purchase or requisition at a fair market price. The allowance of potatoes per capita per day for the population in determining this surplus is to be at least four hundred grams per day. 4. The German Authorities guarantee that the transportation of the imported American food supplies destined for the General Government of Poland, the Etapp of Biala, and the Government of Wilna shall be shipped from Danzig to the German frontier at one-half rate and without charge from the German-Polish frontier to its destination in Poland or the Etapp. There are three principal industrial centers in Poland, namely: Lodz, with about 300,000 workmen, Warsaw with about 250,000, and the Dabrowa mining district with Czestochowa about 200,000; of these 750,000 men and women, about 350,000 worked in the large factories, 400,000 in the smaller ones and at home. With an average family of three for every workingman, it means over two million people now almost entirely destitute. The sudden outbreak of war brought the Polish industry to a complete standstill; but shortly afterwards the offices of the Warsaw Branch of the State Bank being reopened and a certain amount of goods traffic being re-established, our factories reopened to work. Some branches of the industry such as metallurgic and tanning works, having on books orders of the Russian military authorities, and enjoying on this account certain facilities, have even increased their normal production. Generally speaking, our industry has shown a great ability to adapt itself to the changed conditions of production during the war and, successfully overcoming a lack of fuel and great difficulties in traffic, employed in December 1914 in Warsaw 55 per cent of the normal number of workmen, which figure, constantly increasing, reached in July 1915, 75 per cent of the normal employment. In Czestochowa, which the German Army occupied at the beginning of the war, and in Lodz, occupied with a short interval since the beginning of October 1914, the industry came to a complete standstill. Exceptionally only, and for short periods, have single factories in order to assist their workmen, employed for a few days a week certain classes of them. The whole industry of the Dabrowa district is nearly out of work, with the exception of coal mines, which reopened their activity after having set in a working condition their traction plants, which the German Army had destroyed in November 1914. Upon the occupation of Warsaw and of the rest of Poland by the German Army, similar conditions, as mentioned above for Lodz and the Dabrowa district, began to extend over the whole industry. In the first place, we must mention, that a certain number of large factories have been destroyed by the retreating Russian Army; others have been transported to Russia. Specially metallurgy suffered herefrom, particularly factories having orders for the Russian Government, the chemical branch, and many others, such as the probably greatest in Europe for the textile industry, the textile manufacture of Zyrardow. The remaining factories have lost the possibility of selling their articles to Russia, which for many branches of industry has been the principle outlet, as well as to Lithuania and to the country, because of interruption and difficulties of goods, and passenger traffic, and postal communication. It should not be forgotten that permissions for travel are subject to certain difficulties. On the other hand, the industry remained quite without any supply of raw materials and coal. The supply of coal especially remained until the end of 1915 much below the indispensable private needs of the population, charity and municipal institutions, not to mention industry. The stocks of raw materials, which at the time of the occupation of Warsaw were at factories and stores, have been sequestered by the German authorities. In the Dabrowa districts, Czestochowa and Lodz, enormous quantities of raw materials and unfinished products have been sequestered and carried away. Up to the present it is not known at what prices and at what time the payment will be made. In Warsaw, on the contrary, all sequestered goods are bought by a special "Society for purchase of war raw materials" at theoretical prices fixed in free contracts. In fact, these prices are imposed beforehand and with a heavy loss to the industry. People not willing to sell at these prices are running the risk of having their goods sequestered on the same conditions as in Lodz. The release of raw materials indispensable for production, even from the stocks of the factory, is granted with difficulties only, and in quantities not sufficient; in some cases the German authorities have based their refusal of release of raw materials upon the fact that the factory would employ workmen, such specially trained as are lacking in Germany (metal-branch). It has been forbidden to manufacturers in Lodz to give any help to the men, even to their women and children, as long as the workmen belonging to the family and able to work, have not given their consent to go to work in Germany. The policy of the occupying authorities can be summed up as follows: all raw materials and unfinished products from Poland must be used up by the German industry; the live power of the factories, their workmen, must be transported to Germany. As our workmen are unwilling to go to Germany, they must be compelled to by misery at home, through full stoppage of all work . All articles in the Polish press regarding this question are systematically crossed by the censor. "In conclusion the Governor General is of the opinion that it is wrong and injurious to industry to endeavor to bring it into activity during the war and before the re-establishment of free commerce and traffic and before the demand for articles is forthcoming. He is rather of the opinion that the re-establishment of an industrial life should be left to the development of general conditions of the war, political and economic, and that no interference of the authorities should at present take place." There are approximately 15,000,000 people in the German occupied eastern area, including Russian Poland and Western Russia. Of this population between 3,500,000, and 4,000,000 people are concentrated in, or in the immediate neighborhood of the cities of Warsaw, Lodz, Tchenstochova [Czestochowa], Vilna, Kovno, and Biala Etappe. 1. The American Commission shall undertake the revictualling of the above-mentioned cities only. The German Government to undertake to furnish to the cities above mentioned a supply which will cover a ration of 400 grams of potatoes per diem per capita, 10 grams of salt per diem per capita, 10 grams of sugar per diem per capita, and 3 grams of tea per diem per capita. The American Commission to import cereals to an amount which will afford a ration of 340 grams per diem per capita of wheat, or beans, peas, rice, maize, also, with 40 grams of fats per diem per capita, and a moderate amount of condensed milk for children. 2. That the German Government shall undertake to revictual the whole of the balance of the population in the occupied territory. 3. The German Government will undertake to devise financial means for the provision of gold exchange abroad to pay for the foodstuffs purchased by the American Commission. The Allies to give necessary permits for these financial operations by the Commission. 4. The German Government will make the necessary arrangements to turn over to the Commission sufficient German shipping to do the entire transportation from North America or other places to Danzig. 5. The revictualling to last only until October 1, at which time the new harvest will take care of the entire civilian population. 6. The German Government to undertake that there shall be no interference with the imported foodstuffs; that they shall be consumed absolutely by the native civilian population; that the American Commission will be furnished every facility for the control of the entire revictualling of the cities in question, including the German contribution to the ration. 7. In order to carry out the above it will be necessary to import approximately 40,000 tons of foodstuffs per month. It is proposed that such portion of these foodstuffs as goes to the well-to-do population should be sold, and in this particular the German Government is prepared to give free railway transport over the occupied areas and one-half railway rates over the German State Railroads. It is proposed to provision the destitute without cost. There is here a strong feeling of sympathy for the destitute of Poland and a demand which is increasing that relief should be sent to them. The Department advises to all inquiries that Hoover is endeavoring now to obtain the necessary permission to extend over Poland organization of the Belgian Relief Commission. Advise Sir Edward Grey, if you see no objection, of the anxiety of large numbers of American citizens and of their wishes to send assistance to Poland. Refer to Department's 2926 of the 23d and request Hoover to make prompt reply. I always approach this practically hopeless subject with feelings of depression. Mr. Walcott has arrived here and we have both been extremely active in English Government circles, endeavoring to get something done. It seems almost hopeless, but we do not intend to give up as long as there is an atom of hope. I enclose herewith a memorandum which we got up by way of basis of discussion with the English Government. Since writing you we decided that it was quite useless to suggest that a preliminary step should be taken by the Germans apropos of Sir Edward Grey's letter, but that we must try to push the English Government to an undertaking that if we could get something in the nature of this memorandum from the Germans they would pledge themselves in advance to accept it. I hope no one will think that we have displayed any lack of energy in this matter. I have myself interviewed fully fifty people of importance----officials and other personalities---in fact my agitation of the matter has got me into some trouble with regard to Belgian relief, as it is obvious that the blockade wing of the English Government does not want this matter agitated. On the other hand, there are certain members of the Cabinet who are favorable and it seems to me that it wants a decent man to peg away at it with all his abilities. So far as the question of chairmanship is concerned, I have no desires in the matter. I think it would be fine for you to be chairman and if it is desired that my present body of operators should take the matter in hand I should be delighted to have the title of General Manager or any other, so long as I could be assured of your permanent support. Our friends in America are also agitating strongly in the whole of this matter, and it is possible that the pressure of American opinion may yet have some effect. 1. Memorandum of plan of organization which we propose for the relief of the population. 2. Recent report by Mr. Walcott of the Rockefeller Foundation. 3. Report by Dr. Kellogg of our staff. 4. Petition which we have received from certain Warsaw committees. The plan which is enclosed has been informally submitted to Sir Edward Grey and is under consideration at the present moment. You will notice thereby that the method we are proposing involves limiting our relief to urban and refugee population and imposing upon the Germans not only a contribution of actual foodstuffs to these urban populations, but further imposing upon them the entire sustenance of the agricultural population. Furthermore, it provides that the Germans shall pay the expenses of our imports and furnish ships. You will realize that, looking at it purely from the point of view of the German interest, they must maintain alive the agricultural population in order that the fields may be planted for the forthcoming harvest, at which time the relief is to absolutely come to an end, i.e., October 1, 1916. For the Germans to take care of the agricultural population and make a contribution to the foodstuffs that we use for the urban people, it will be absolutely necessary for the Germans to import from Germany large amounts of foodstuffs and thus more than cover the points raised by the Allied Governments as to the abstraction and absorption of the native food supply in Poland. You are fully aware that the situation is one of the utmost gravity, and that every day is of importance in the maintenance of such vast numbers of human lives. Under the inspiration of your suggestion that you might, if agreeable to Sir Edward Grey, take the matter up by cable with the Russian Government, I hope you will not resent my suggestion that it might be discussed at length with them by cable, instead of awaiting instructions through the post. The British reply to Hoover's in memorandum of the 21st February was finally delivered on the 10th May. The Allies accepted the proposal in principle, but with certain conditions, the most important of which were that Austria-Hungary make the same commitments as Germany in respect to Polish relief and further that the Governments of Germany and the Dual Monarchy make similar guarantees in respect to Serbia,(322) Albania, and Montenegro, which had been conquered by the armies of the Central Powers in the last months of 1915 and in January and February 1916. Either of these conditions was probably sufficient to wreck the relief project, and at best they meant long, and difficult negotiations. The present negotiations had moved so slowly that it was no longer possible, as originally planned, to bring food from America to Poland on German ships. Hoover, therefore, proposed to ask the Swedish Government to permit the export of supplies for the immediate relief of Poland. The Foreign Office vetoed this scheme, being unwilling, apparently, to give Sweden any further cause to ask for an increase in imports through the British blockade. As had been anticipated, the Germans refused to accept the British conditions with regard to that part of Poland under Austrian administration, and with regard to Serbia, Albania, and Montenegro. Gerard, however, made a counter proposal, to which the Germans were agreeable. This counter proposal was promptly rejected by the Foreign Office, which still insisted on the conditions of the earlier note. 1. The scheme submitted by the United States Ambassador relates only to that part of Russian Poland at present in the occupation of the German forces. His Majesty's Government consider it essential that any system of Polish relief should apply to Russian Poland as a whole, and they cannot recognise the existing division into two spheres, occupied respectively by German and Austro-Hungarian troops. There must be a definite undertaking by the two Governments that the export from the whole of Russian Poland of all foodstuffs, native or imported, will be absolutely prohibited, and that any excess over domestic needs which may exist in the southern part under Austrian administration (which is understood to be self-supporting) will be employed exclusively for the provisioning of Northern Poland, whether such foodstuffs are utilised to supply the towns under the care of the Relief Commission or the country districts to be revictualled by the German Government. 2. It is understood from a document(324) which has been communicated to His Majesty's Government by Mr. Walcott of the Rockefeller Foundation, and of which a copy is annexed to this memorandum, that the German authorities in Northern Poland undertake that all food supplies originating in Poland shall be used exclusively for the civil population and the constabulary. His Majesty's Government cannot admit that the constabulary should be allowed to use native foodstuffs which have subsequently to be replaced by supplies imported by the Relief Commission. They must therefore request that in this respect the constabulary should be placed on the same footing as the occupying army. 3. From the same document it appears that the German authorities wish to export from Poland any excess of the potato supply. As a result of the experience which they have gained in connection with Belgian relief, His Majesty's Government are most reluctant to agree to the exportation from Russian Poland of so-called excess supplies, since the question of what constitutes an excess is largely a matter of opinion. Nevertheless, in order not to prolong the negotiations, His Majesty's Government agree to the export of potatoes at such times and so long as, in the opinion of the neutral relief authorities, an excess supply in fact exists over and above the requirements of the whole of Russian Poland. 4. The German vessels mentioned under paragraph 4 of Mr. Page's proposal must fly a neutral flag, be under the sole control of a neutral body to be agreed upon, be manned by neutrals, and be run entirely at the expense of the German authorities. 5. It should be understood that the responsibility of the German Government is not ended by the supply of the partial ration mentioned in the above scheme of relief. His Majesty's Government cannot undertake to allow the Relief Commission to import more than a minimum supplementary ration over and above the maximum which the enemy are in a position to supply at any given time. 6. The neutral relief authorities in Poland must enjoy absolutely free and unfettered facilities for the communication to their London office of any data connected with their work. They must have every facility to satisfy themselves of the manner in which the undertakings of the German and Austro-Hungarian Governments are being carried out in all parts of Poland. It is, of course, understood that the "German relief officer for the civil population" mentioned in the enclosed memorandum before alluded to shall have no control of any kind over and shall in no wise interfere with the complete discretion of the American Commission or its representatives. 7. The German and Austro-Hungarian Governments should undertake, as a part of the present arrangements, adequately to supply and care for the populations of Serbia, Albania, and Montenegro, all of which countries are now being reduced to a state of starvation through the removal, or the use by the occupying forces, of the supplies of native foodstuffs. The carrying out of this undertaking should be under the supervision of neutral subjects or organisations in those countries. His Majesty's Government trust that the above proposals, which represent merely the renouncement of indefensible practices and assurances for the due respect of the lives and rights of the population of occupied territories in the future, will meet with the prompt acceptance of the German and Austro-Hungarian Governments, so that the necessary preliminary arrangements may be made without delay. We have had an opportunity of examining the memorandum on Polish relief which you received from the British Government yesterday. On this business there is no actual relief action for us to take until it has been submitted to the German Government and their impressions on the matter ascertained. In the meantime we think it is desirable to point out that five months have gone by since Polish relief was proposed by us and three months since this plan was formulated, that this scheme implies a complete termination on the 1st October and that, therefore, there only remains four and a half months from today in which to operate. Assuming we get at once the undertakings from the German Government in accordance with the British Government demand, the time involved in securing and transferring the German ships, their equipment and return loaded to Baltic ports would probably absorb fully three months. It appears to us, therefore, that oversea food supplies cannot be brought into Poland in consequential amounts during the period yet remaining. The only hope of the immediate relief of Poland exists in the co-operation of the Swedish Government. If it were agreeable to the British Government to make arrangements for the export of supplies from Sweden it might be possible to secure some immediate relief. I am, therefore, asking Mr. Warwick Greene to go to Stockholm to examine the position there. In any event, nothing tangible may be done until the German portion of the contract is negotiated, with regard to which we are not optimistic. With reference to your letter of May 12th in which you suggest that the Swedish Government should be asked to supply immediate relief to Poland as soon as the German and Austrian Governments agree to the conditions laid down by us, I would like to say that it appears to be unnecessary to ask for any active assistance from the Swedish Government, and there are reasons of a general political kind which make us particularly anxious to avoid it. We shall, of course, have no objection to the Relief Commission importing into Poland any foodstuffs which they may be able to obtain in Scandinavia as soon as the scheme actually comes into force, and no doubt the Swedish Government would be prepared to give permits for the export of such foodstuffs from Sweden, if such are required. It would, however, be undesirable that the Relief Commission should call upon the Swedish Government for any more positive assistance than this issue of licences. I should like to add that it would in the opinion of the Allied Governments be far preferable if supplies were obtained and transported from Roumania. This would among other things have the advantage of avoiding any question of replacing in the country of export the supplies despatched to Poland, since there are abundant stocks of grain in Roumania which are not required by the native populations and which in fact it is to the direct advantage of that country to export. First. Germany can contract only as to Polish territory in her own control. However, in my opinion there is no doubt but arrangement similar to one outlined below can be made with Austria. Please note that all towns named are in territory occupied by Germany. Second. Germany cannot make question of relief of Poland dependent on Germany and Austria relieving Servia, Montenegro, and Albania, since Germany is not in control of these countries. Germany, however, will use its good offices for the establishment of similar relief work in these countries. First. The arrangement to apply to all Polish territory occupied by Germany commencing fifty kilometers back of firing line. Second. Germany will give to inhabitants of cities to be relieved the ration proposed. Third. Germany will undertake the remainder of population outside will be fed. Fourth. It is necessary that occupying or police army of about 150,000 men be fed on food bought in Poland. These troops are sometimes ten or fifteen in a village and difficulties of transport make this necessary. Fifth. Proposition as to ships accepted. Sixth. Germany will arrange to pay for goods wherever bought and their transport. Seventh. Germany agrees to proposition that excess potatoes shall be exported only when Commission agrees and that no food is be exported from Poland and used except as above stated. Provisions as to details of control can be arranged. Germany is willing to accept control as stated in contract signed by Geheimrat Lewald, Doctor Bicknell, and me in April 1915. Will get details as to numbers of occupying police army and how many in towns and how many in country. I have the honour to acknowledge the receipt of your letter of June 2nd in which you are good enough to communicate the reply received from the German Government to the proposals of His Majesty's Government for the relief of Poland. The phrase somewhat loosely used in this reply as to the arrangement being made "to apply to all Polish territory occupied by Germany commencing fifty kilometres back of the firing line" is, I suppose, intended to allude only to the responsibility assumed by the German Government to feed this area, and does not imply an attempt on the part of the German Government to extend the importations of foodstuffs to be made by the American Commission to any other districts but the cities specified in the original proposal which you handed to me, and in my reply. His Majesty's Government could not, of course, for a moment consider importations to other destinations besides those towns; but I do not know whether His Majesty's Government are to understand that the German Government intend to allow the population within fifty kilometres of the firing line to starve. I do not think it is necessary, at this point in the discussions, to enter into any detailed analysis of the German reply, and I will confine myself to the two points of primary importance raised in it. The German Government disclaims any responsibility for the relief of Serbia, Montenegro, and Albania on the ground that it is the Austro-Hungarian Government which is in control of those countries. I cannot accept this disclaimer, knowing to what extent the policy of the Central Empires is controlled by the German Government and knowing it is therefore not a question of the German Government exerting its "good offices" with the Austro-Hungarian Government, but of the two Governments jointly assuming a responsibility towards the population whose territory has been invaded by their joint armies. Nothing short of a binding engagement of this kind, which the Central Powers are perfectly able to give, can satisfy the Governments of the Allies, who in this matter are only asking for the same measure of joint action on the part of their enemies which they themselves have already taken in their consultations and their decision upon this question of Polish relief. The second point is, to my mind, of even greater importance. The German Government disclaims responsibility for the Polish territory occupied by Austria on the ground that that territory is not within the sphere of Germany's control. The Governments of the Allies regard Poland as a whole and they cannot allow the fate of its population and the question of life and death whether that population shall or shall not die of hunger, to be parcelled out between Germany and Austria, each country claiming a part of Poland in connection with their political schemes for the future, and each disclaiming responsibility for the part occupied by the other. Until there is agreement between the Governments of the Central Empires to throw the resources of the whole country into one, and to give to the Poles, as Poles, the produce of the soil of their own country, the Governments of the Allies cannot move. This is a question of principle, but even were it not so, the conduct of the Austro-Hungarian Government, as it is developing at the present moment in Southern Poland, would make it impossible for His Majesty's government to leave that region out of account in the scheme of relief. I annex hereto a copy of an Order issued by the Austrian Governor-General of Lublin which throws sufficient light on the methods of coercion and the intentions of exploitation which the Austrian Government are employing and cherishing. For the rest, we must adhere to our original demands, which I still believe would be accepted as reasonable if the German and Austrian Governments were sincere, and I can only trust that the efforts of the United States representatives in enemy countries and of the representatives of the American Relief organisations will soon elicit a more satisfactory reply from the Governments of the Central Empires. In May when the spring work in the fields will be practically completed, the military administration will begin work, within the territory administered by it, on the building of roads and on the Vistula. Numerous labourers will be used for this purpose. The military administration will summon them from among the local population , and form them into labour detachments, each of which will be employed as far as possible within its own village or its neighborhood. It will, however, be impossible to avoid the employment of some detachments in other districts of the Government than their own. It is, however, to be clearly understood that all labour detachments will be used exclusively within the territory of the Government of Poland in Austro-Hungarian occupation. As need may arise, all men fit for work will be called upon. The only exception will be those to whom the district authorities may grant exemption in consideration of their profession or for other weighty reasons, in accordance with instructions issued to them. In case of need also women will be employed, provided they come forward of their free will. The workmen will be properly paid and fed. The attention of the population is hereby drawn in advance to the forthcoming order, and to its purpose, so that no one should give credence to false rumours. As work is concerned which will be of considerable economic advantage to the entire country and in connection with which each particular workman will find a sufficient livelihood to maintain himself and his family, the military administration expects that all men fit for work will apply in their own well-understood interest for inclusion in the labour detachments, and will in that way avoid compulsory orders. The intended works are unavoidably necessary from the military point of view, and must be carried out in any case. The military administration hopes that it will not be necessary to use compulsion. The British letter of the 15th June 1916 presaged the final breakdown of the negotiations. It was, of course, too late to put the original plan into effect before the harvest. Moreover, important political developments had significantly changed the whole Polish problem. The shortage of man power which had produced deportations and forced labor in Belgium led the Germans to greater lengths in Poland. Along with deportations of Polish workers to Westphalia, a plan was evolved to recruit a Polish army to be used by the Central Powers. Nominally this army was to represent the independent Poland which Germany and Austria, after months of wrangling, had agreed to establish on the fragment of Polish territory occupied by the Germans. The German-Austrian declaration respecting independent Poland was not made until the 5th November 1916, and in the meantime two further efforts were made in behalf of the Poles. On the 7th July the State Department appealed(328). to the belligerents "in the name and interests of humanity," and President Wilson on the 20th July sent personal letters to the King of England, the President of France, and the Emperors of Russia, Germany, and Austria-Hungary, asking for a fresh consideration of the project and pledging the cooperation of the people of the United States. These appeals were in vain. There were no concessions in the replies of the British and German Governments, but only arguments to saddle each other with the responsibility for the failure of Polish relief. The United States Government, at the request of the various belligerent Powers, has been acting for many months as an intermediary in the negotiations between the belligerents relative to a proposed agreement as to the terms under which relief supplies may be introduced into Poland and distributed therein. Since, however, all the negotiations have so far failed to result in any agreement which could bring about the desired result, although all the countries interested have manifested a willingness to permit relief supplies to be sent to Poland under certain specified conditions, the Government of the United States, therefore, in the name and interests of humanity, now appeals to all the belligerent Governments to consider whether it is not possible for the Powers on each side to make such mutual concessions in the terms proposed by them for the regulation of shipments of relief supplies into Poland as will make it possible for an agreement to be reached under which relief can be given to the suffering inhabitants of Poland. I have the honour to acknowledge the receipt of Your Excellency's communication of July 8, in which you are good enough to lay before His Majesty's Government an appeal to all belligerent Governments to come to an agreement for the relief of Poland. If the German and Austro-Hungarian Governments will reserve wholly to the civil populations of the territories which their armies have occupied---viz., Belgium, Northern France, Poland, Serbia, Montenegro, and Albania---the entire produce of the soil, all livestock, and all stocks of food fodder, or fertilisers in those territories; if they will admit to these territories neutrals selected by the President of the United States with full powers to control the distribution of food to the whole population and to transfer, when necessary and possible, from one territory to another surplus stock existing in the one and lacking in the other; and if the President of the United States will undertake the selection of these neutral agents, His Majesty's Government will on their part give them every assistance in their power and will admit into such territories any imported food supplies necessary to supplement native stocks and to afford to the populations a fair subsistence ration, so long as they are satisfied that their enemies are scrupulously observing their part of the agreement. If this offer is refused, or if the German and Austro-Hungarian Governments do not reply before the harvest in the occupied territory begins to be gathered but continue to refrain from stating officially, for the information of the Allied Governments, their exact attitude in regard to these questions of relief, His Majesty's Government will hold them responsible, and will exact from them such reparation as can be secured by the Allied arms or enforced by the public opinion of the neutral world, for every civilian life lost through insufficient nourishment in every territory occupied by the armies of the Central Powers. It is obvious that if this proposed scheme is to be put into operation successfully no time must be lost. The new harvest will shortly be gathered, and for the plan to be of any advantage to the populations of the occupied territories the fruits of the harvest must be placed in neutral control before they have been appropriated for the use of subjects of Germany and Austria-Hungary. "From the very beginning the Imperial Government declared its readiness to offer its assistance in order that the distress apparent in those parts of Russia that are occupied by German troops and systematically wasted and deprived of all victuals for the use of the remaining inhabitants by the retreating Russian hosts be eased by the relief work of the United States of America, which is organized on such a great scale. The Imperial Government has particularly offered all guarantees consistent with the requirements of war that the imported foodstuffs will only serve the needs of the population of the territory occupied. Accordingly the American relief might have been realized several months ago with the same provisions as in Northern France, had not the Government of Great Britain prevented its accomplishment by clinging to its unfounded and impracticable conditions. In this way it has become practically impossible to convey a considerable amount of foodstuffs from America to Poland by the expiration of the term set, as the end of the relief work is October first. Accordingly further negotiations are devoid of purpose. But on the other hand, thanks to the intense culture of the land effected by the Imperial Government by using all the means available and every effort possible in the occupied territory, and owing to the favorable harvest prospects, a relief action after October first, 1916, can apparently be dispensed with. The fact that the population of Poland and Lithuania will, to some extent, suffer until the new crop is lodged and later on will sometimes have to put up with straitened circumstances can therefore not be laid to the blame of the Imperial Government but to that of Great Britain." I enclose herewith for your information copy of a note from the British Foreign Office in reply to the foregoing. I have the honour to acknowledge with thanks the receipt of Mr. Page's communication of July 31st in which His Excellency was good enough to convey the reply of the German Government to the offer of the Allied Governments with regard to the relief of occupied territories. I will not comment on the vagueness or the inaccuracies of this reply, such, for instance, as the baseless statement that it would be impossible to import any foodstuffs into Poland before October 1. Such controversy would, I feel, be useless. His Majesty's Government now have before them the present statement of the German Government in regard to Northern Poland, and the statement of the Austro-Hungarian Government in regard to Serbia which I had the honour to bring to the attention of the United States Government in my note of July 20. Both statements are diametrically opposed to the assertions of those who submit constant appeals to the Allied Governments on behalf of these occupied territories. His Majesty's Government note that in the opinion of the German Government, which may be now regarded as in control of Austria-Hungary also, further negotiations are devoid of purpose. In these circumstances His Majesty's Government feel that they can do no more and they must leave it to the Government of the United States to take such further steps, if any, as they shall think right and useful. The tone and content of these British and German notes left no doubt about the futility of further efforts along this line. Within a few months the unrestricted U-boat campaign, the Russian Revolution, and the declaration of war by the United States so transformed the political situation that there was never again any question of reviving the neutral relief project. This, of course, did not mean that the Poles of the Congress Kingdom no longer were in need. The harvest of 1916 had improved conditions somewhat, rendering the import of large supplies from abroad less necessary, but there was still great suffering. Polish factories had either been dismantled by the Germans or forced to close their doors for lack of raw materials; thousands were unemployed and without funds to buy the food which the harvest made available. The Polish and Jewish relief societies in America, in order to aid their kinsmen, made great efforts to increase their contributions for transmission to the local relief committees in Poland. They very soon encountered difficulties, for the Allied blockade not only stopped the flow of food into territories controlled by the enemy, but it also rigorously restricted the movement of funds. The financial life of Poland had been merged with that of Germany, and hence any considerable importation of dollars into Poland would strengthen the German exchange. In view of the suffering, however, the British had permitted limited relief remittances to go through to Warsaw. (329) After the United States entered the war, the U.S. War Trade Board, which handled such matters, followed a similar policy, permitting certain firms and relief societies to transmit limited relief funds to territories occupied by the enemy. This plan, which would have been of great benefit to both Polish and Belgian relief, failed, as the following documents indicate, because the British blockade officials feared it might benefit the Germans, while the Germans feared it would not. H. C. Hoover, Esq. Washington, D.C. I have received your several cables in regard to forwarding Polish Relief Funds to Warsaw through the medium of food importations into Belgium. Upon the receipt of the first one I cabled Rotterdam, explaining the proposition and asking them to obtain the consent of the German authorities to the procedure; also the acquiescence of the Dutch Minister, and also to obtain from Francqui his statement that there would be funds available to carry on the operation in German marks in Belgium. As a matter of fact, I think there is no question whatever about these funds, but we have not heard a word in answer to our cable, despite its urgent nature and a hurry-up that has been sent since. There seem to be a great many political considerations connected with the whole matter. Upon receipt of your first cable, as a matter of form I inquired of the British Foreign Office if the proposal had their approval. I attach copy of reply from the Foreign Office and other correspondence in the matter. I have been in communication with Mr. Beal of the Embassy, who is appointed on the Committee referred to by Mr. Carr. Mr. Beal advised me confidentially that there is a standing committee on the Financial Blockade of Germany which has been considering this subject of funds being sent into Poland. At present funds are sent over to Holland where pounds are transformed into guilders. The Dutch banks then buy German marks. These funds are then transferred through the German postoffice, usually at Hamburg, and by this means are delivered to various Polish relief committees in Poland. After some time, frequently several months, receipts are returned, or, where the funds have not been delivered, the money itself is returned, so that on the face of it there appears to be a fairly good control. On the other hand, I am advised that most of these receipts are merely marked with a cross and there is great doubt in the minds of the Financial Blockade Committee whether the money is in fact delivered properly. The most important point, however, is that there seems to be no check upon the exchange. The Polish peasantry will accept only Polish paper roubles. These, it is understood, are turned out in any quantity as required, and dependent upon the capacity of printing presses. Some of the members of the Committee have expressed the belief that Germany gets from one-half to three-fourths of all the money sent in in this way. Last year the small contributions amounted to between £300,000 and £500,000. I pointed out to Mr. Beal and he will lay a memorandum, which I have prepared, before his Committee, showing that the only way at present available for sending this relief into Poland without bolstering exchange value of German marks is through the food contributions sent into Belgium and transferred in Belgium into German marks and then transferred under the control of the neutral Dutch Government directly to the Warsaw Committee, where it matters not into what currency it is then converted. A memorandum will be drawn up along these lines today which I trust may be useful although I note you can make arrangements with the British Government in New York. The matter of exchange to be used is one that causes me some anxiety. I presume the Comité National will not want to make an actual loss on this transaction, which will mean that the standard rate of 25.40 would have to be used. I notice you twice refer to a favorable exchange rate being given. Will you not outline by cable on receipt of this letter just what your ideas of appropriate exchange would be. Another argument brought up by the Finance Blockade Committee is that the Germans make a practice of taxing the Poles just as soon as they find they have any money to pay taxes with and in this way immediately collect everything in the way of cash that is sent in. They also advance the argument that, as the peasantry are working directly for Germany, providing assistance of this kind is almost equivalent to assisting the Germans with money. These are arguments with which you are already familiar. The relief is, I take it, primarily intended for Poland, and would in the ordinary course take the shape of a remittance of money. By sending food to Belgium and selling it there you would not be relieving the destitute, but merely placing food within reach of those who have the wherewithal to pay. Further, by the sale of the food you would obtain a credit in enemy-occupied territory, which can, of course, be transferred to give financial relief to the population of other enemy-occupied territory without having had any direct influence on the mark exchange. Indirectly, however, the sending of food must have an effect on the mark exchange as it liberates the country where the food is sent from providing funds for the purchase of food abroad. Further, would the Germans allow the purchases of foodstuffs being made in German marks? I must say that, as I stated at the meeting at the Foreign Office the other day, it seems to me very unwise indeed to send money into Poland at this moment whichever way it goes. War is war, and destitution and starvation are the calamities of war. It is praiseworthy to mitigate such calamities, but it is the duty of the Germans to support the populations of the country they occupy. Sending money into Poland merely enables the Germans to prolong the war. In fact, the proposal in its origin seems to me to be bad. The German is only too delighted that the starving Belgian should pay for his own food sent in from abroad. It impoverishes the Belgian and relieves Germany from the necessity of finding food. Referring to your kind letter of October 31, 1917, No. 13015, 1 have the honor to inform you that I have communicated to the competent authorities the request contained in the above letter, to hand to the Dutch Consul at Warsaw about one and a half million francs, to be transferred to the Benevolent Committee for Poland. The competent authorities regret very much to be unable to comply with your request, the said transfer being contrary to the monetary interests of Germany. They call your attention to the possibility of transferring values in marks from foreign countries to the occupied territories of Poland, viz., the purchase of marks in neutral countries.